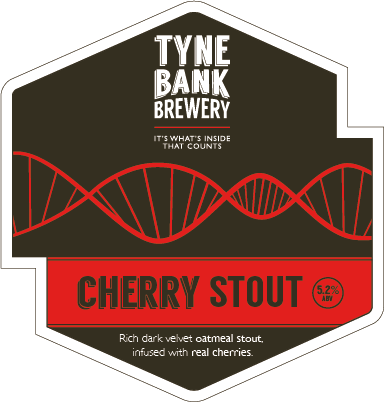 Tyne Bank Brewery: Cherry Stout at GBBF. We are delighted to announce that our ever popular Cherry Stout will be available at this year's Great British Beer Festival, the highlight of the British real ale calendar. This huge event takes place from 11th - 15th August in London's Olympia Exhibition Centre, and features over 900 real ales, ciders, perries and international beers from over 350 producers. This year one of our favourite beers has been chosen to appear on one of the festival's 27 bars, and represent the region among Britain's best beers. Cherry Stout is a 5.2% oatmeal stout brewed with whole cherries. The already complex malt bill which contains a blend of roasted, chocolate and dark malts is enhanced with the addition of oatmeal for a velvety smooth mouthfeel. A mix of sweet and black sour cherries provide layers of fruit notes which combine with the malts for a 'Black Forest Gateau' character, as the flavours unfold with every sip. Our first Christmas special, we knew instantly that we had to brew this beer again, and it's since become a firm favourite available year round in bottles and occasionally on cask. If you're heading down to GBBF next month make sure you grab a half, if you can't make it don't worry, it will be available locally on cask from next week. Keep your eyes peeled for a unique barrel aged version being released later in the year, follow us on Twitter, Facebook and Instagram for the latest news.